Note: The Tanzer 16 Fleet is not an active fleet with the Carolina Sailing Club as of 2015. However, Tanzer sailing continues in the North Carolina area. 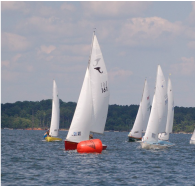 The SAYRA series takes place at multiple venues in NC, and two events are held in conjunction with CSC, including the Governor's Cup at Kerr Lake in June, and the One-Day "Miller Time" Regatta at Jordan Lake in July (See link to SAYRA NOR for 2015 above). Come out and sail with the Tanzers! 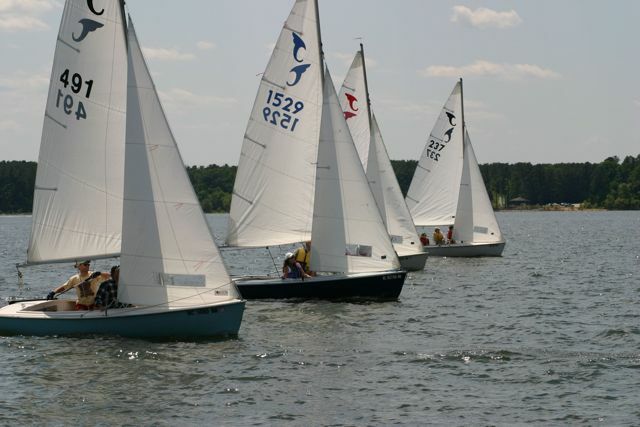 The Tanzer Fleet of the Carolina Sailing Club is unique in that it also serves as the Class Association for the Tanzer 16. Our fleet is a small but active, tight knit group that is always looking to expand. The Tanzer 16 is no longer in production, but that should not deter the prospective Tanzer skipper. The used boat market is very active in this area and a race ready boat with sails and trailer can be found for $1000 to $1500. The Tanzer 16 Class Association has a bond program (see below) and can help find a boat in good shape for you. If you are interested in the Tanzers, you can often get a close look and a ride at the CSC races. The local fleet (#1) is focussing on getting boats on the line at both Jordan Lake and Kerr Lake in the CSC Championship Series. There are 1-day races on Sundays, and 2-day races throughout the season, during the warmer part of the year. Come on out and have some fun! The Fleet also actively participates it's own series of races, the Tanzer 16 SAYRA One-Design Series (see link above) held at various venues in North Carolina, including Lake Townsend, Kerr Lake, Jordan Lake, Belhaven (Pungo), Blackbeard Sailing Club (New Bern) and Lake Waccamaw. A "One-Day Regatta", also known as the "Miller Time Regatta is held each year, to honor our long-time friend and Tanzer 16 champion, Lawerence Miller, (#1529) who passed away in 2012. This year (2015) the regatta will be held in July, at Jordan Lake in conjunction with the CSC Championship Series. continued until 1985 with the last boat (1585) being built in the plant in Edenton, NC. After Tanzer Industries closed, the Class Association acquired the molds and is currently looking for a builder to manufacturing new Tanzer 16s. The Tanzer 16 is a center board day sailor that is known for its good manners and simplicity. The rig consists of a non-tapered mast with external halyards and no spreaders. The boats often sport a spinnaker that can be launched from a chute, simplifying set up and take down. A Tanzer 16 can be rigged and on the water is less than 30 minutes. Since this is a One-Design class, the specifications and measurments are tightly controlled and fairly enforced. The goal is to promote family sailing and racing, rather than the need for costly modifications or equipment. It is the skill of the skipper that counts, rather than the technology of the boat. This being said, no two Tanzers are rigged exactly alike, and a variety of "ergonomic" preferences are visible in the layouts in the current boats in our fleet! Tanzer 16's come on the market fairly regularly. The Tanzer 16 Class Association maintains a "bond" program, whereby it purchases these boats, and often several boats are available. The bond program works like this: you indicate your interest in a Tanzer to the Class, and put up a $500 bond towards a boat. The bond is held in escrow, and you can get it back anytime before purchasing a boat by asking. When boats become available and ready, and as your name comes up in the que, the Class will let you know and you get your pick of the available inventory (or you may wait for another boat to become available). The boat prices vary depending on the condition, but good, race-ready boats, with a titled trailer under them typically run between about $1000-2500. The Class Association makes sure that the boats meet weight and other Class specifications, and that they are seaworthy. Thus, boats coming from the bond program are ready to sail and race. The full bond can be earned back by racing the boat for 10 days in any 1-year period (not necessarily a calendar year), and there is no "cutoff", so it is possible to wait a year or two. If you do any one-design racing and are affiliated with one of the local clubs (like CSC, Lake Townsend Yacht Club or the Waccamaw Sailing Club), earning the bond back is easy to do. Qualifying races can be at any local regatta, race or race series, not just the CSC or Tanzer SAYRA series. The only catch is that racing should be against at least one other Tanzer. Many happy Fleet members have bought their boats through the bond program, and have been able to earn their bond back in a year or less. Contact either the Class Association President, Arch Altman (Arch Altman Fleet Captain email), or the Tanzer 16 Class Association measurer, Pete Thorn regarding the bond program or to indicate your interest.